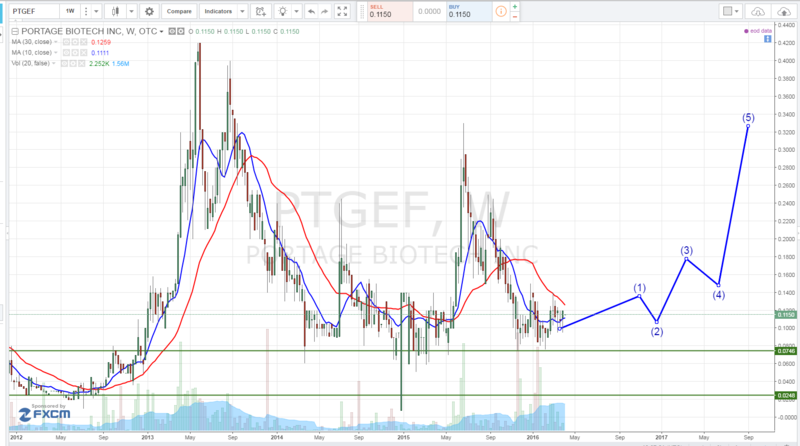 Several investors are taking interest in a small biotech company, Portage Biotech Inc. (OTC Market: PTGEF; Canadian Securities Exchange: PBT.U). Portage Biotech has a revolutionary pipeline, massive insider buying, and a very seasoned management team dedicated to taking the company to the next level. It’s widely known that the Biopharmaceutical industry is a money producing behemoth, generating north of US$200 Billion Dollars’ worth of revenue globally and growing at annual rate of 9%, double that of conventional pharma. The top products alone, known as “Blockbusters” generate a minimum of US$1 Billion Dollars annually just to be considered a part of that elite club. To produce “Blockbusters”, or even mildly well-received products, companies must invest mountains of money into Research and Development, production facilities, regulatory costs, marketing, etc. often climbing to amounts in excess of hundreds of millions. Thus, the widely recognized powerhouses such as Pfizer, Merck & Co., Bayer, and others certainly had to pay a price to become the stalwart incumbents that we see today. 1. “PPL-003” Is essentially (without getting too technical) a proprietary platform for delivering cargo into cells targeting previously un-druggable and unmet medical needs, which basically means that they can deliver help to areas of the human body that were previously out of reach. The upside of this delivery platform is significant. As an example, PPL-003 is moving forward to an IND for inflammatory eye disease and Uveitis, which is the third leading cause for preventable blindness in the United States. 2. “BVH-0223” is a product of their drug development platform for multiple therapeutic indications, more specifically mental illnesses such as depression and anxiety that have thus far proven resistant to available treatments. By identifying an area of the pharmaceutical sector with a severely dried-up pipeline, they seek to bring the first new class of antidepressant to the market in more than 30 years! Now that’s a disruptive innovation. 3. The company recently received favorable and productive feedback from their Pre-Investigational New Drug Application (PIND) interaction with the Food and Drug Administration (“FDA”) for the indication of amyotrophic lateral sclerosis (“ALS”) and announced an expedited development path. 4. Also noteworthy, Portage’s orphan drug designation request was just granted covering BHV-0223 for the treatment of spinocerebellar ataxia (SCA) by the FDA. Before the end of 2016, they expect to initiate a randomized clinical trial of its new chemical entity (NCE) glutamate modulating agent in patients with spinocerebellar ataxia. The study will enroll approximately 120 patients in the U.S. and will evaluate acute symptomatic treatment in this patient population. The trial is expected to support a New Drug Application (NDA) in SCA. 5. Portage made an investment in Sentien Biotechnologies Inc, a regenerative medicine company. The proceeds will be used to fund its Phase I study of their lead product, the Sentinel™, a cell-containing dialysis device for the treatment of Acute Kidney Injury (AKI). Sentien has the potential to disrupt the regenerative medicine space. In preclinical models, their lead product has shown strong potential to have a meaningful clinical impact in AKI, a significant unmet medical need, as well as other organ failure indications. Portage’s Chairman Dr. Gregory Bailey said that “Sentien has developed a novel way to administer the therapeutic factors produced by their cell therapy product. This investment in the pipeline is a good adjunct to our portfolio of products that can reach inflection points in under 2 years. Good to note Dr. Bailey was the seed financier of Medivation (NASDAQ: MDVN) until he put the Portage team together. 6. Portage Biotech Inc. (along with its 52.86 %owned subsidiary Biohaven Pharma Inc) also acquired the world-wide intellectual property rights to a portfolio of over 300 prodrugs owned by ALS Biopharma, LLC. The prodrugs covered by the agreement were designed and prepared by Fox Chase Chemical Diversity Center, Inc. (“FCCDC”) through a research program funded, in part, by the U.S. National Institutes of Health, through two peer-reviewed Small Business Innovation Research (SBIR) grants awarded to FCCDC. Portage is still relatively unknown, as management has been quietly focusing on building the company and acquiring stock. They have not yet actively pursued an Investors Relations campaign, but are looking into one very soon. This could be the right time to look into Portage as an investment opportunity! The 3 largest shareholders are Portage’s Chairman Dr. Gregory Bailey M.D., CEO, Dr. Declan Doogan M.D., and Director, renowned investor Jim Mellon. Together they own over 50% of the stock. Equally important, is they are buyers! Bailey and Mellon subscribed to a total of $2.6 million into the last 2 private placements. They have also been buying large blocks (over 18 million shares) on the open market over the past year, as recent as April 2016. This reflects the confidence that executives and management have in the company, and they want more skin in the game!! PTGEF may look like a start up on the surface; however under the hood, the engine is powered by some of the most well-known names in the business. At the helm is former Pfizer superstar Declan Doogan MD, their CEO who most notably played a key role in the development of one of today’s most well-known drugs – Zoloft. He’s joined by a rock-star executive team who bring a combined 200+ years of pharmaceuticals experience to the firm from some of the most well-known banners in the world. It took this exceptional team a mere 18 months to make the huge leap from being a preclinical stage Company to that of one clinically testing out its inaugural candidate to treat General Anxiety Disorder (and other CNS indications). Portage Biotech plans to move more candidates into the clinic this year. Portage’s strategy is as simple as it is savvy: they’re engaged in researching and developing pharmaceutical and biotech products through to clinical “proof of concept” with an initial focus on unmet clinical needs. Following proof of concept, Portage looks to sell or license their products to large pharmaceutical companies for further development and commercialization. Herein lays the brilliance of what PORTAGE BIOTECH INC (OTC MARKET: PTGEF) brings to the table with their ultra-innovative ‘develop until proof of concept’ strategy. By tapping into some of the best minds in the game and funneling their resources into the Research and Development of their pipeline, and leaving the burden of hefty marketing and production costs to others, they can focus on what they do best – innovate and deliver life changing products! Portage has a couple of explosive, life changing products poised to turn the industry on its head. They have some game-changing products in their pipeline that, if brought to market, will send shockwaves through the industry. Those in the industry know and the capital markets are highly anticipating and exuberant about the thought of them coming to fruition. Considering the massive impact these products could have on the industry, it’s no wonder Biopharmaceutical enthusiast and popular investment guru Jim Mellon hitched his wagon to Portage by joining their board of directors – he knows a winner when he sees it! His optimistic view was on further display during his recent presentation at the Master Investor Show, where he included Portage Biotech Inc. on his list of long recommendations. There’s something BIG happening over at Portage Biotech Inc. suggesting that more breakthrough ideas are still to come in the following months ahead in 2016! !